The afternoon the Peanut and I went to our teaparty, I discovered the most wonderous thing - flowering teas. They are handcrafted little tea pods that bloom when put in hot water. They are beautiful and delicious, all in one. The Peanut and I thought it was way cool!!!! We bought one, and recently tried it out. They make great gifts - but make sure you have a clear glass teapot or bloom in a clear glass. 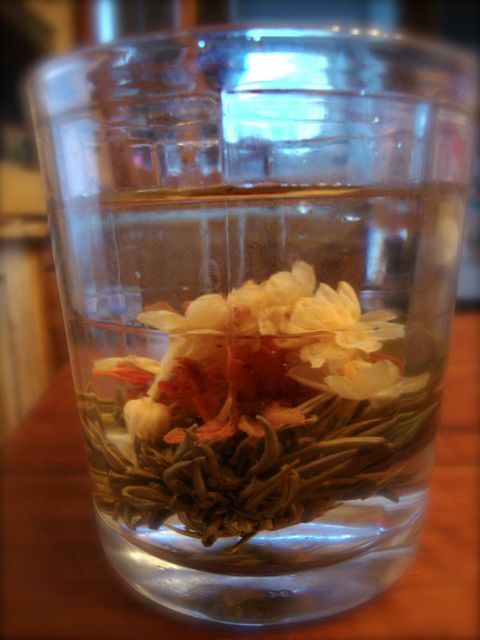 Otherwise the beauty of the tea flower slowly unfurling in the hot water into an amazing spectacle, will be wasted. What will they think of next? um... yum!!!!!! love it. dropping by from blog frog to follow. hope you'll do the same. www.rebeccalynndunning.blogspot.com. Have a great day. It tasted yummy, too!!! Thanks for dropping by! Oh! I must get you some of the teas I have at home then!